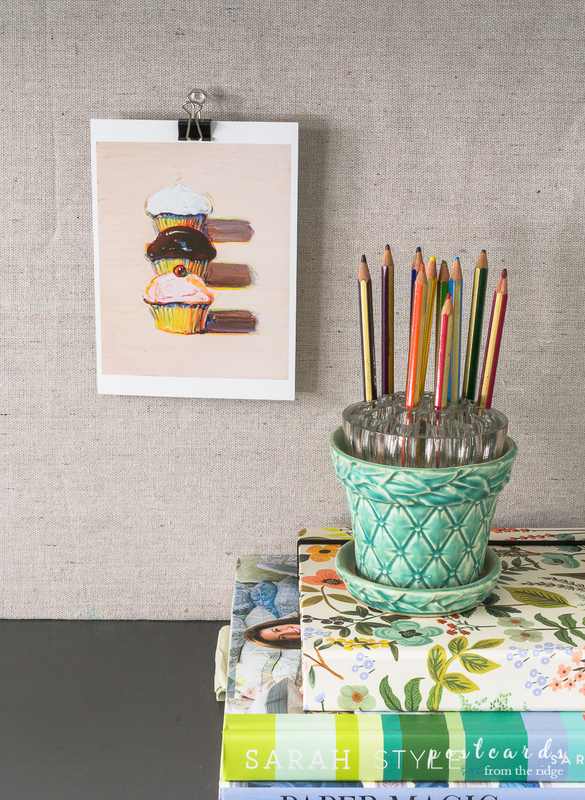 There's nothing like flowers and plants to make a place feel homey. They add such a nice cozy touch to any space, and you can almost always find pretty ones at the grocery store for a bargain. There are so many different ways to contain or display them and today I'm sharing a dozen different ideas, just in time for spring. Tulips are a spring favorite and they come in so many pretty colors. I found these yellow tulips at the grocery store and simply added them to one of my white pitchers. There are so many styles of white pitchers available and they're perfect for flowers or branches. For these mini carnations I used some vintage milk glass vases and grouped them together on a wooden cake plate as a centerpiece. So simple. 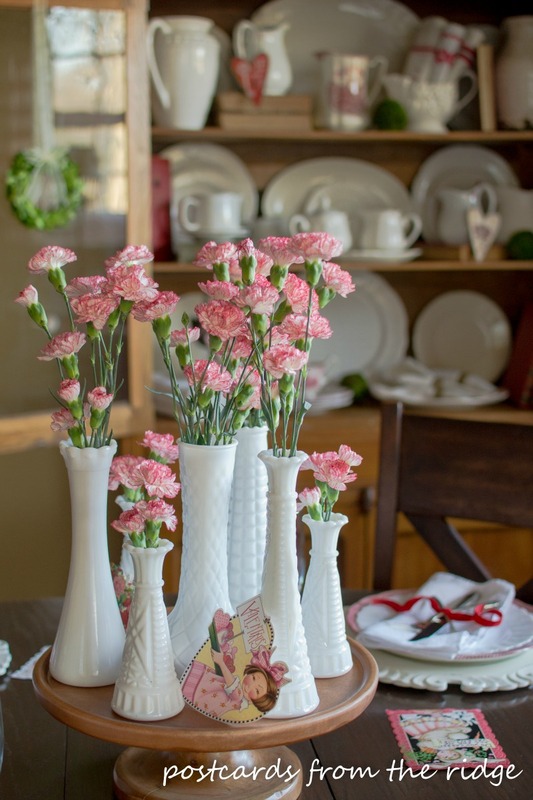 The milk glass vases come in all shapes and sizes and are very inexpensive. To see more photos of this Valentine's table setting, go here. We got a set of these silver bowls as wedding presents 25 years ago. They're a bit tarnished, but I like them that way. We're not a shiny silver kind of family. I dried some roses that the Mr. gave me and snipped the buds off and added them to one of the silver bowls for a shabby chic look. 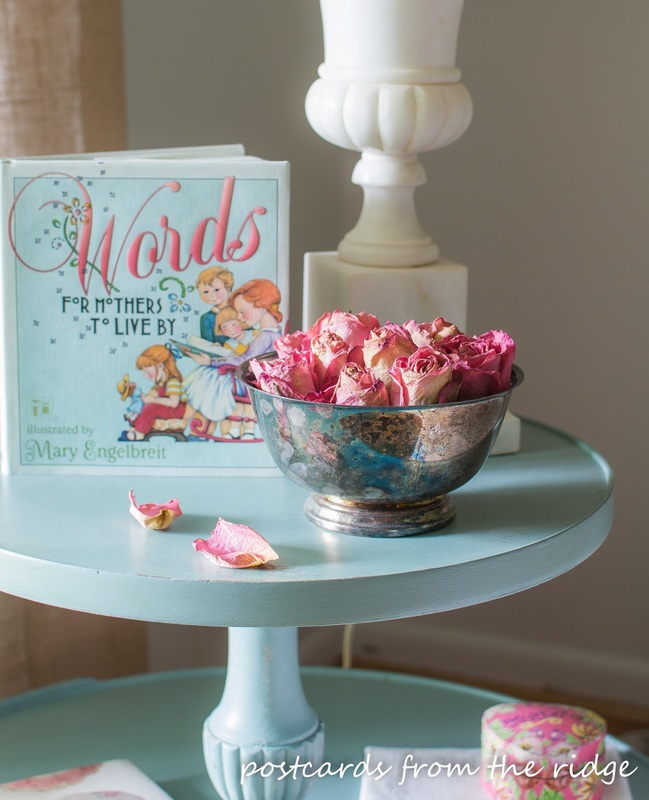 For more photos with these dried roses and the tiered table, go here. A tall blue glass vase is a great way to hold some artificial branches for a seasonal display. You could place any type of branch in one of these. 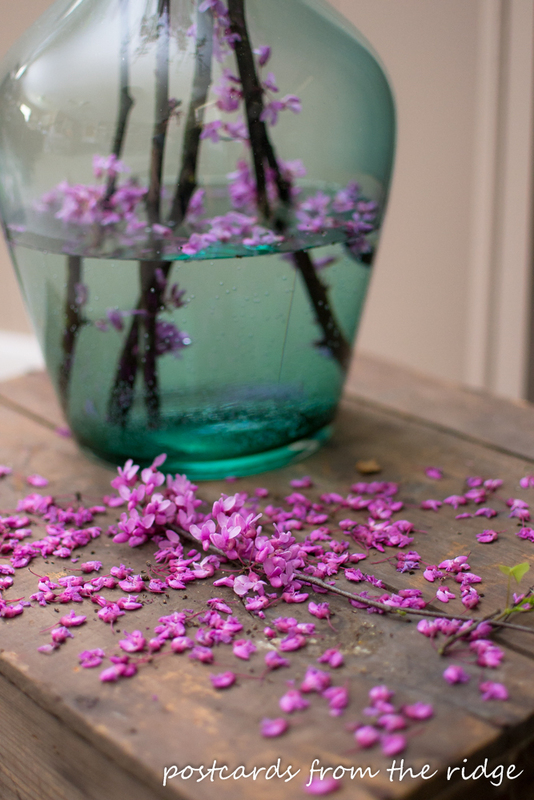 I prefer dried or artificial ones because the vase would be really difficult to clean if you used fresh branches and added water. Maybe there's an easy way to clean it? I'd love any suggestions! My dad's beloved radio flyer wagon greets us on the front porch with seasonal flowers and decor. I usually have some type of flowers or branches in my olive bucket, which is one of my very favorite belongings. You could also use a metal watering can for branches or flowers. 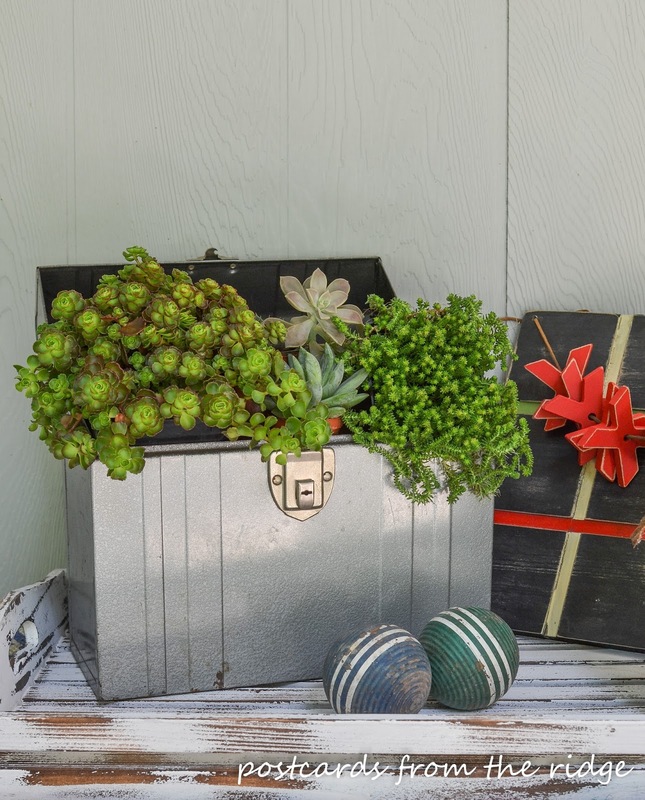 Go here to see more of our summer front porch decor. 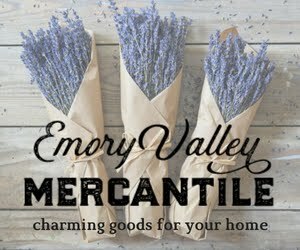 Blue mason jars are perfect for spring and summer clippings. 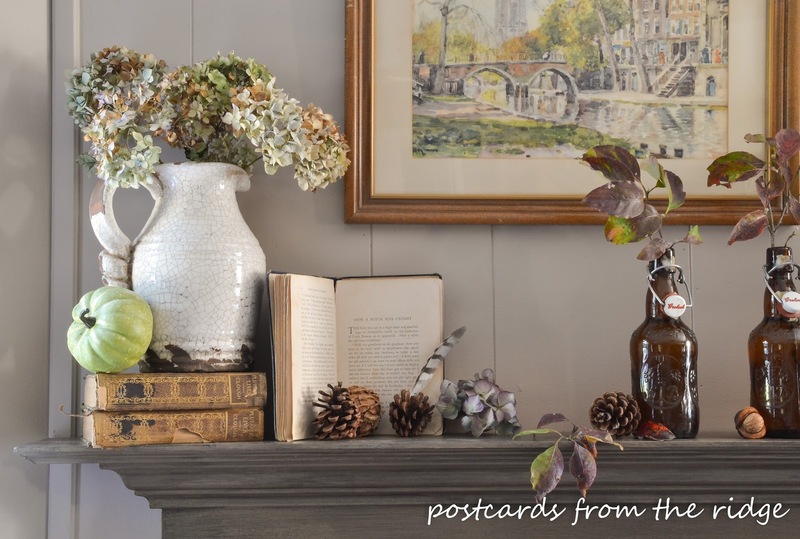 They have such a cozy farmhouse look and are perfect on a table, shelf, or just sitting pretty on your kitchen counter. 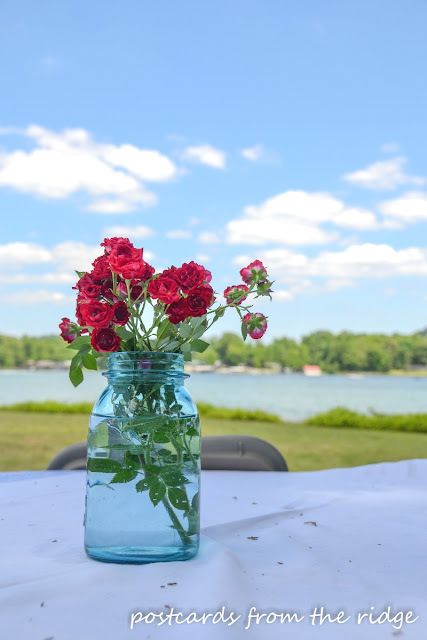 To see more of our summer lake party decor plus our fun photo booth, go here. A French flower bucket is a wonderful way to display branches or long stemmed flowers. 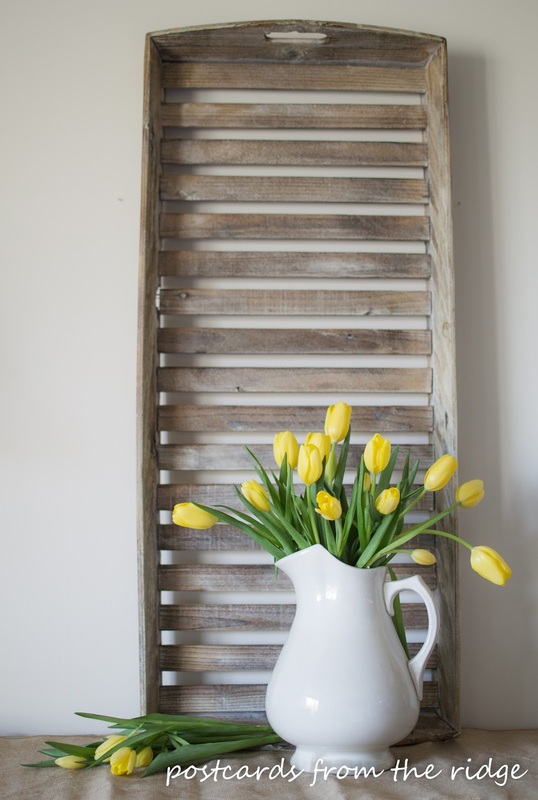 You could put them in front of a fireplace or in a entry for a nice way to greet your guests. 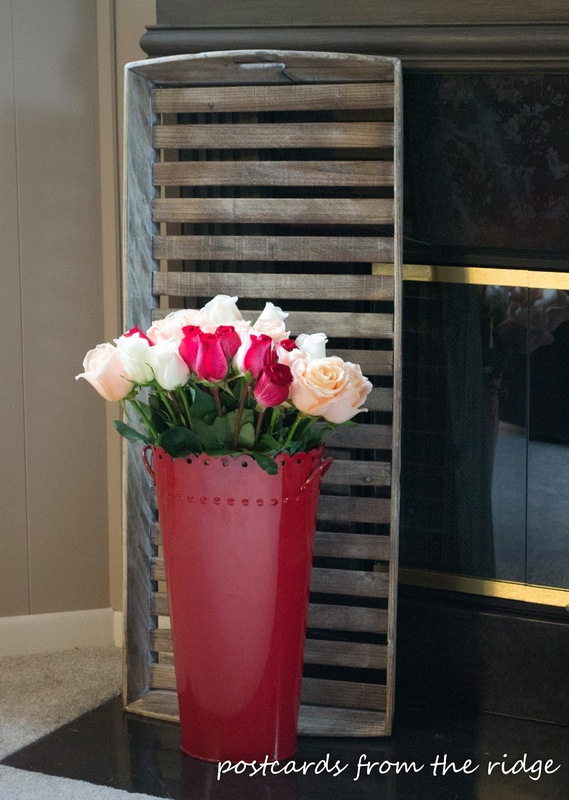 Go to this post to see more simple Valentine's decor ideas. 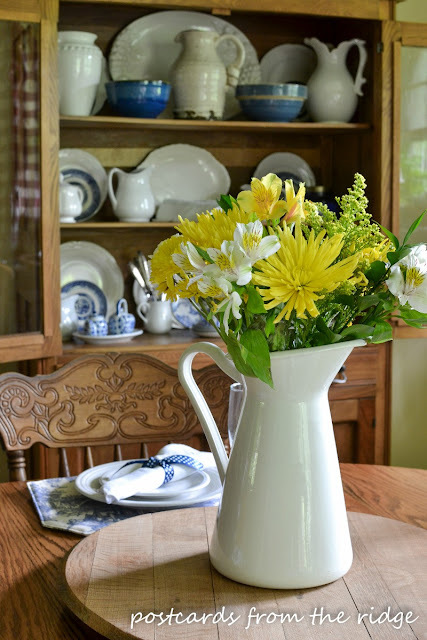 A white pitcher full of flowers makes a great centerpiece. Simply stunning! More of our summer decor can be seen here. 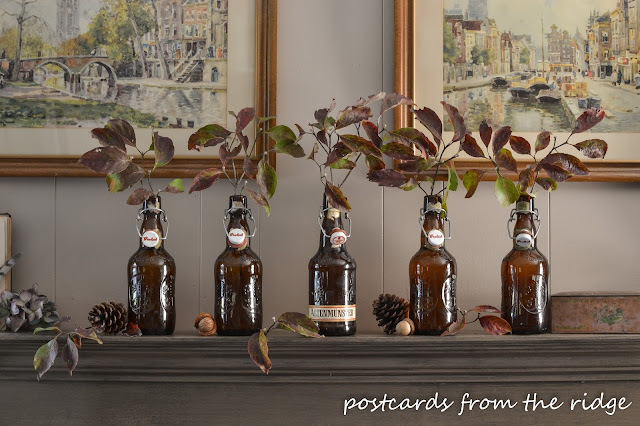 Amber bottles are a unique way to display stems or branches. I decorated our fall mantel with these last year and loved the rich color of the bottles paired with the fall colors on some dogwood branches. To see the entire vintage themed fall mantel, go here. A vintage metal file box is a fun place for some succulents. We had this on our front porch last summer as a fun greeting for our guests. 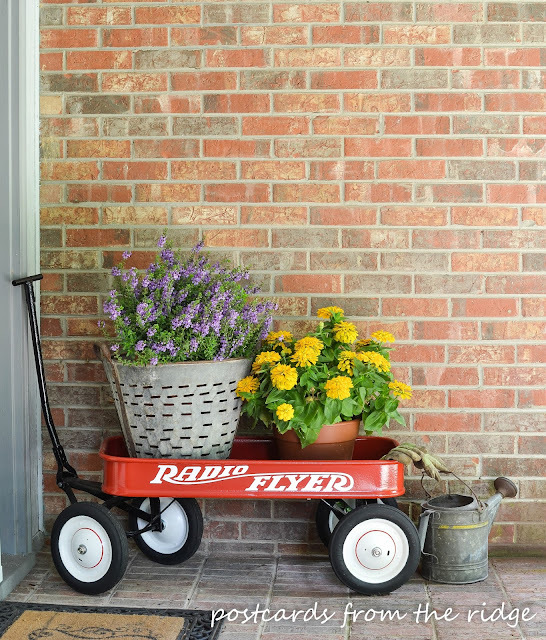 For more summer front porch ideas, go here. 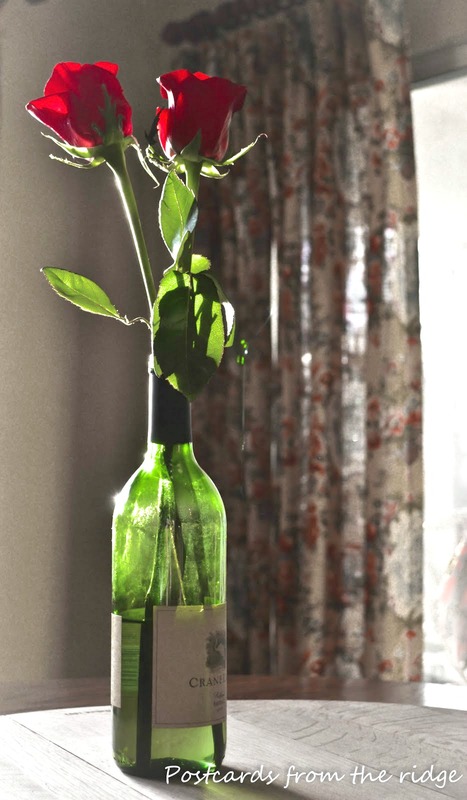 Hang on to some empty wine bottles to use as vases. They're perfect for a couple of long stemmed roses. Clear glass extract bottles are another nice way to display your flowers. 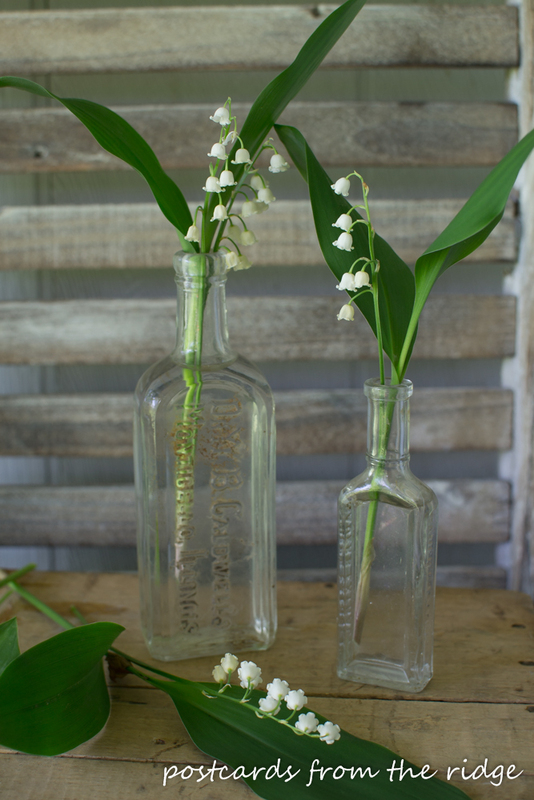 These lilies of the valley are the perfect size for the petite bottles. 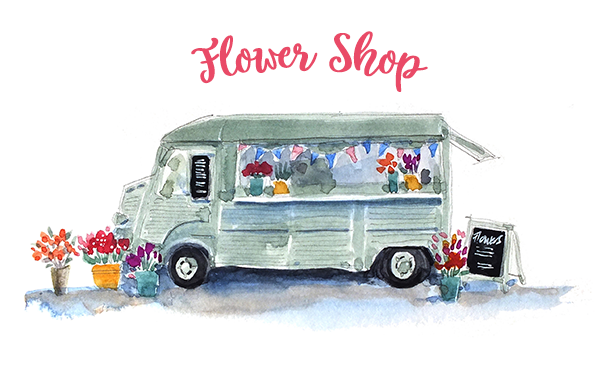 There are so many other items that would be great as flower containers. 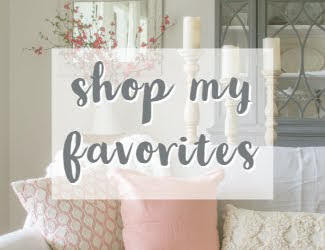 Just a few that come to mind are vintage medicine bottles, insulators, or even kitchen colanders. 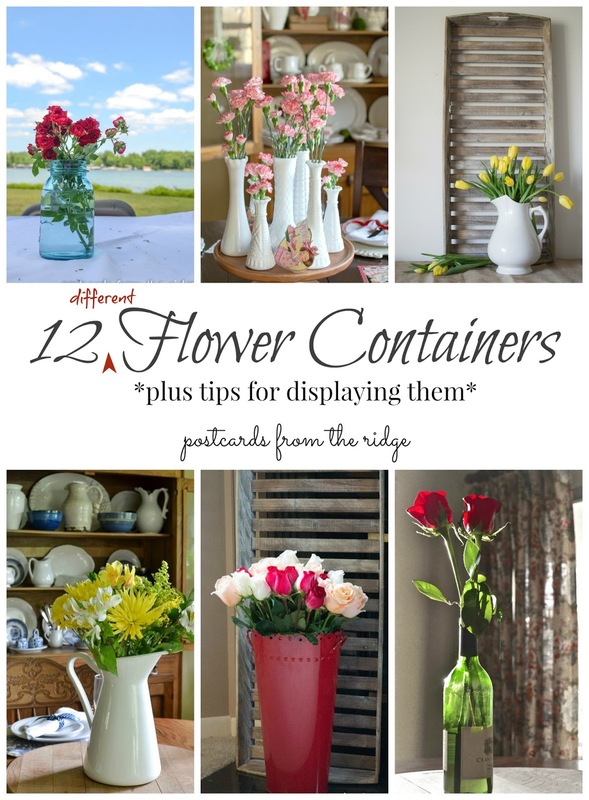 What are some fun containers that you use for flowers? I love all of your beautiful flower arrangements!! Pitchers are my favorite tools! I use them for SO many purposes. To clean skinny necked vases, fill with hot water and drop in one or two (depending on size of container) denture cleaning tablets. The dollar store ones work perfectly well!! They will also clean tea pitchers that get grungy from the tea residue. Thanks! That's a great tip! !